Body Shock: A one hour workout with Ashley focusing on weight training, core training, stabilization and balance using isolated and full body movement with dumbbells, barbells, resistance tubes, balls, steps, and mat work. Body by Jacqueline: A one hour class devoted to weight training, core training, stabilization and balance using isolated and full body movement with dumbbells, barbells, resistance tubes, balls, steps, and mat work. Butts & Guts: A 1 hour class using weights and resistance bands, focused on lower body exercises and abdominals, both weighted and non-weighted. 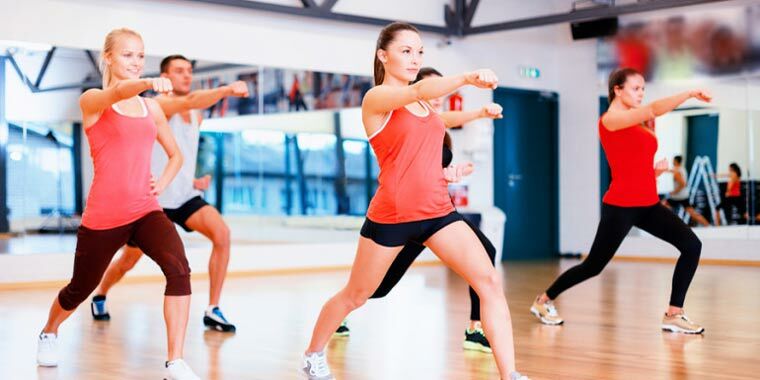 Cardio Fusion: A one hour class using muscle toning, kick boxing, and dance based movements. Cardio Tennis: A one hour class with 15 minute intervals of tennis oriented drills using the court, ball, and racquet, and plyometrics, core stabilization, lateral movement, and full body exercise. Core and Cycle, 60/90 min; Cycle w/Weights Inteval: Classes incorporating cycling for cardiovascular, upper & lower body weight training exercises, and abs in an inteval format. Length of intevals and types of exercises vary with each specific class. Circuit Training: This class consist of three ten minute intevals of cycling and circuit training using seven or eight exercise combinations utilizing strength, stability and core in the circuit. Each exercise is done repetitively for one minute. The class is for all levels in that everyone can work at their own pace and resistance. It's fun, faced pace, and focuses on strength, core endurance, and stability. Come join us!. Cycle and Body Blast: A really awesome spin workout class! Spin for half the class, then weight training, core,training, abs, and resistance bands. Cycle/weight training: A Cycle and body weight workout for all your major muscle groups. Get lean, build strength and tone muscles with a weight training group-based class. You will be using free weights, plates, barbells and an aerobic step to work all your major muscles. Participants choose weights based on their exercise and their personal goals. Dance Aerobics: A one hour, choreographed, hi/lo aerobics class performed at a moderate to fast pace suitable for those who love to dance. Upbeat and fun with great music and toning floor exercises included. Dance and Core: Experience the joy of dance, and learn a step-by-step, 64-count routine using rhythms, like cumbia, salsa, reggaeton, balliwood, African, and more. ExerClass: A great full-body fitness class with one of our Certified Personal Trainers. This FREE one-hour class gets your blood pumping while playing fun and exciting group fitness games. FITKIDZ: New class for kids ages 8–12 years old. There will be circuit training; body weight with squats, pushups, planks and lunges. Agility and speed drills; latters, cones, jumps and sprint. Dancing; to warm up and add some fun funky time. Yoga; to stretch the muscles at the end and cool down. Free time to play and meet new friends! All levels are welcome! R.I.P.P.E.D. : A total body workout, utilizing resistance, free weights, body weight, power plyometrics, endurance, and cardio training for a fun, full body workout! REMIX: Come mix it up and get a great weight and kickboxing workout! Super Cycle; Indoor Cycle; Cycle for Strength; Late Night Spin: Includes many diverse types of rides in different energy zones including: recovery, endurance, interval, strength, race day, hills and speed work. One Full hour of cycling, great training for outdoor cyclists both avid and recreational. Target Kick Box: A one hour cardiovascular class using free form kick boxing movements, plyometrics, and target based kicks and punches. Triple Threat: One hour high intensity class with modifications, building endurance training using weights, cardio, and core. Fun and sweaty packed class for the evening time. World Rhythm Dance: A one hour class using a variety of dance moves like Swing, African, Salsa, Hip-Hop, and others strung together in a sequence. Each of the classes has a theme based on the type of dance taught. Lots of fun! Zumba: It's a fusion of Latin and International music that creates a dynamic, exciting, and effective fitness system that works the entire body. ZUMBA is alive at the Racquet Club! Zumba originated in Columbia in 1990 when Aerobics teacher, Beto Perez, forgot his usual music and had to improvise with the traditional Latin/Merengue music he had in his car. That class ended up being a huge success and is the birthplace of Zumba as it is today. It is now taught in 35 countries with over 20,000 certified instructors. Classes are music based on Salsa, Merengue, Cumbia, Raggaeton etc. Zumba's mission is to get fit and have fun!! There are no complicated moves to learn and you don't need to be coordinated. Not to mention the music is so infectious it makes you want to dance. "It's a great way to lose weight, increase strength and coordination, foster self-esteem and have fun all at the same time!" ZUMBA: Ditch the Workout, Join the Party! Abs & Back: 1/2 hour class of strengthening exercises for abdominal, oblique, and back muscles. Aqua Pilates: Mercedes incorporates Pilates moves with water aerobics throughout the class so you get even greater results. Aqua Pump: Join Paula in the Pool and pump your body with high energy inertia, buoyant core challenges, and dumbbells for an upper body power blast. Chair Yoga: A gentle approach to yoga that offers a number of yoga postures to help lengthen the spine and increase flexibility. The chair is used as a prolongation of the body to support us, keep us balanced, and to overcome any limitations we may have. Core Training: A 1/2 hour class of strengthening exercises for local and global core. Low Impact Aerobics: Incorporates walking floor movements forward and back and side to side, kept to a moderate pace with lightly weighted strength building exercises in intervals. Set to fun music of the 40's, 50's, and 60's. Mat Pilates: Full body exercises performed to strengthen the core using holds, pulses, and full range of motion in prone, side lying, supine, kneeling, and standing positions. The benefits are many; overall body strength, balance, flexibility, and stress relief! PiYo: The PiYo system is a total-body strengthening workout. Poses such as plank, side plank, core work, lunges and squats are key elements to engage large and small muscles of the body. Working in and out of these poses builds strength using the body's resistance. In some classes, light hand weights are used to increase the amount of strength building. PiYo is a high intensity, low-impact, muscle sculpting, flexibility building, core-firming experience! POP Pilates: POP Pilates is a total body, equipment-free workout that sculpts a rock solid core and a lean dancer's body like nothing else can. The combination of total body Pilates exercises with the attitude of choreographed dance and the energy of music, results in an intense workout that is FUN and effective. Every exercise can be modified to fit YOUR personal needs. You'll leave feeling sweaty, strong and ready to take on MORE. Restorative Yoga: An hour-and-a-half class using specific poses held for 10 minutes plus to encourage natural healing properties. Rockin' Low Impact: An easy-to-follow, low-impact class with Bonnie, taught to fun rock and roll music. You'll get a great workout while enjoying a blast from the past. The class will also include body sculpting and flexibility sections at the end of the workout. Great for all age groups and fitness levels. Tai Chi: A sequence of slow methodical movements based on the Tai Chi martial arts form, incorporating balance, focus, full body strength, stretching, and stress relief. All levels of fitness and all ages welcome! Water Aerobics: A one hour aerobics class held in the pool involving all muscle groups in upper body, lower body, and core. It's great for beginners, but challenging enough for the more advanced participant by using the water's resistance at each person's level of fitness. There is almost no impact because of flotation. Lots of fun if you like to get wet! Yin Yoga: While our traditional yoga practice creates more length and strength in the muscles, Yin Yoga creates an opening in the joints and the deeper connective tissues. This mindful practice focuses on the breath as we hold static poses for up to 5 minuets. All poses are done on the floor and offer the opportunity for deep releases and relaxation. Yin yoga allows for more space in both the body and the mind, helping us to release old patterns of movement and thinking while creating strong neural pathways that help ease stress, anxiety and aching bodies. This practice is available for all levels and is a great compliment to any other expertise routine you're currently engaged in. Yoga Flow/Vinyasa: A challenging form of yoga, utilizing breath control, isometrics and focused gazing with an uninterrupted flow of traditional postures. 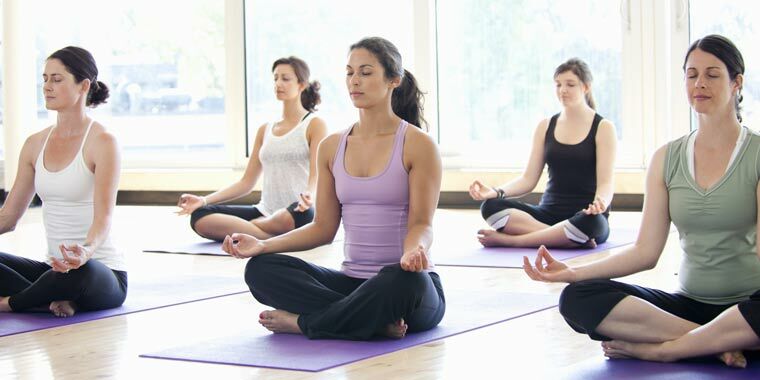 Yoga for Beginners: A class focused on basic poses, stretching, and meditation. Yoga: Hatha Yoga postures performed in a sequence, along with stretching and meditation. Geared towards all levels of Yoga enthusiasts. Yogalates: "The best of both worlds!" Combining the poses and stretches from Yoga with the flowing core movements of Pilates. Please contact the Front Desk if you have any questions about Group Fitness classes!